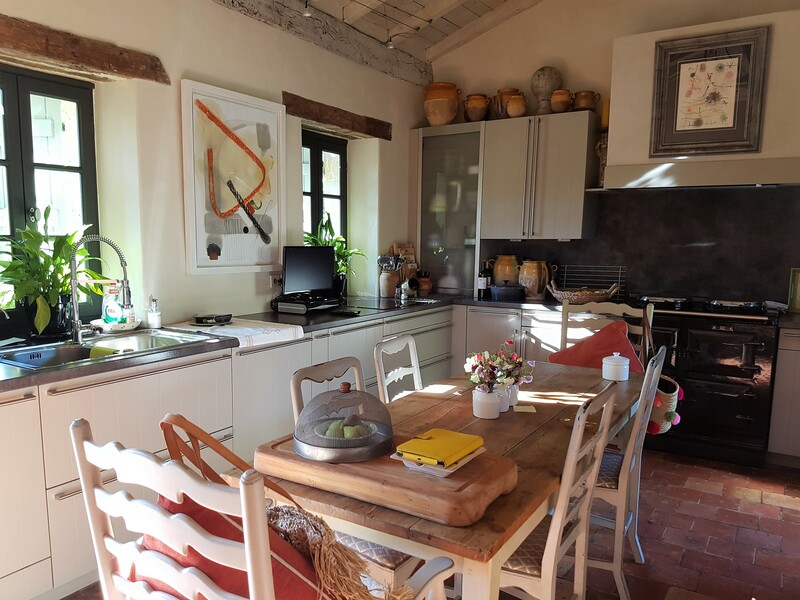 Seeped in history, this beautiful restored private hamlet sits in an elevated position above rolling fields of sunflower and corn, in one of the most desirable areas of Gascony. Far from the incumbrance of a busy road, tucked away in a secluded backwater and surrounded by rich countryside to each side, the property commands views across the valley, and offers utter tranquillity from the world set in a two-and-a-half-hectare estate. The majesty of its central tower with its naïve and rounded forms is as timeless and appealing as a castle in a fairy tale and ensures a unique appeal to this property. A property which is exceptional in both its character and its location. The appeal of being able to offer oneself a private hamlet of one’s own is undeniable, the attractive gardens, well-tended lawns and gentle dry-stone walls lending a gentle and magical appeal to the estate. The estate, comprising two houses, has undergone intensive renovations over the last ten years. This remarkable country home marries period charm with modern day comforts. 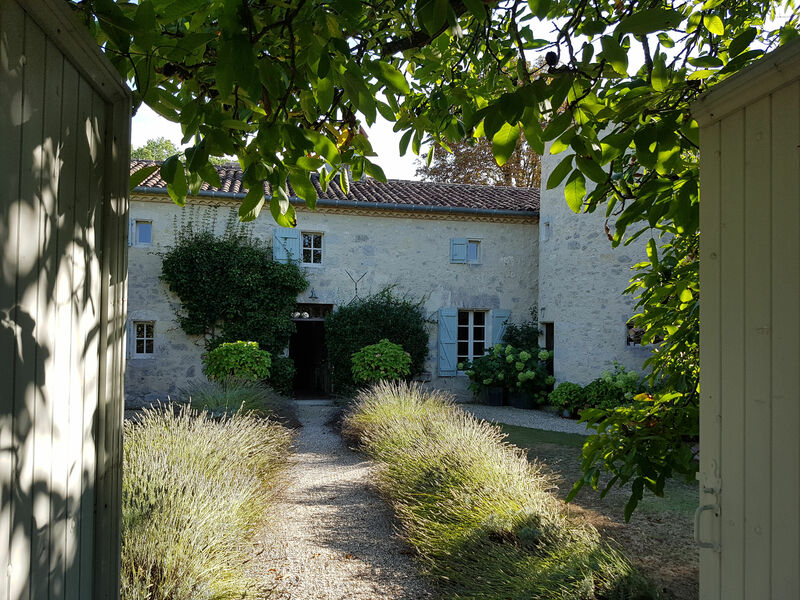 With all the charm of an historical French hamlet in abundance, first and foremost, this is a family home. We begin our visit in the main house. There is a formal entrance hall to the property, but we enter the property from the gardens to the kitchen. The ambiance is that of a comfortable country home. Country Living without the draughts, and with the warmth and soul of a much-loved Aga promising warmth on a winter’s day. A barn adjacent to the kitchen has been converted into an informal outdoor dining-room, the old stone walls offering both shade and character, and linking the house to an outside laundry room, and separate study. From the kitchen there is access to the tower, with its remarkable cork-screw staircase leading to the first floor; and to an impressive triple reception room with an overhead mezzanine on the upper floor. The kitchen opens onto a grand reception room, with a majestic open fireplace, and an impressive vault of old oak beams supporting what was once the barn. This is a perfect entertaining area. It is easy to imagine the fire blazing, and a huge party assembled here for Christmas, a long dining-table running the length of the room. On the other side of the triple reception room, we discover the formal entrance hall. Beyond the entrance hall, with double access to the gardens, there is a more intimate sized sitting-room, beyond which there are two double bedrooms along a private wing; one opening onto a private bathroom, the other with access to a separate bathroom. We access the first floor via the stone staircase, and find ourselves on a mezzanine-style hallway, which overlooks the main reception room, and forms a type of minstrels’ gallery. The hallway runs the length of the property, with two further double bedrooms and bathrooms at the end. In the grounds of the property there is a guest house, set at some distance from the main house, and perfect for an extended family. 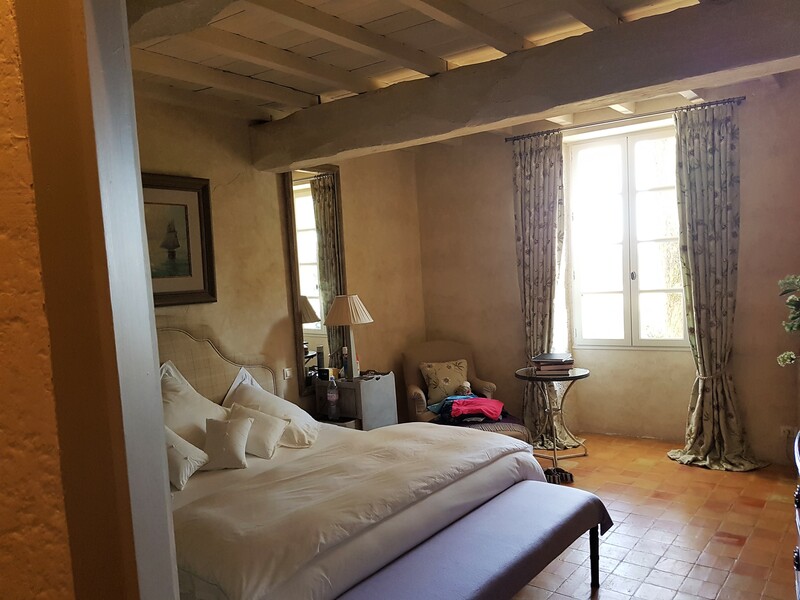 The guest house has two double bedroom and a bathroom on the ground floor, and a third bedroom upstairs. This is a spacious house, measuring 84m2 on the ground floor and 33m2 on the first floor. Here at Bliss we particularly like: the location of this property, perched on high, with its fabulous stone buildings and tower. The gardens which are an utter delight: mellow, inviting and with an irresistible marriage of dry-stones walls and roses. The two separate buildings, both spacious and beautifully restored, with a mélange of grand reception room, and more intimate “cosy” spaces. The rarity of owning a private hamlet and country estate, in an area renowned for its history during the second world war. If you are as intrigued as we are by tales of The Resistance, and midnight exploits by brave and daring citizens of France and The United Kingdom, stories with which writers such as William Boyd have regaled us, this is an area of rich local historical interest.